"I am the Alpha and the Omega," provided symbolism for the early church as appears on this 3rd-4th century sarcophagus now in the Louvre in Paris. 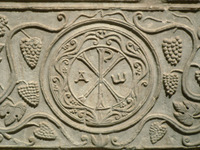 The monogram of Christ stands at the center, with the alpha to the left and the omega to the right. Surrounding it are the vines and branches, furthering the message of life in Christ. Fittingly, the stone burial container is decorated with a strong theological statement of life beginning with faith in Christ and ending with eternal life through him. Sarcophagus of Drausin, from Art in the Christian Tradition, a project of the Vanderbilt Divinity Library, Nashville, TN. http://diglib.library.vanderbilt.edu/act-imagelink.pl?RC=49988 [retrieved April 26, 2019]. Original source: https://commons.wikimedia.org/wiki/File:Sarcophage_de_Drausin_03.JPG.